NOTE: This product is only designed for use with solar panels sold at the Adafruit store. We cannot guarantee this will work with solar panels purchased elsewhere. Please purchase this kit and panels from Adafruit to ensure optimized functionality! A 2.1mm adapter is also required to adapt a solar panel to the DC power jack. Our carefully designed charger is designed specifically for solar charging, and will automatically draw the most current possible from the panel in any light condition! Even thought it isn’t a ‘true’ MPPT (max power point tracker), it has near-identical performance without the additional cost of a buck-converter. 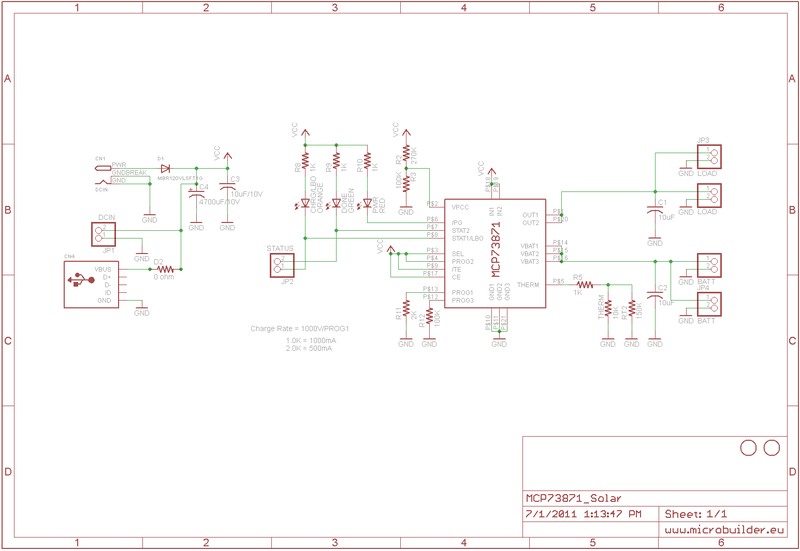 Our detailed tutorial on how to use this charger includes a design document explaining how it all works. Will always draw the most current possible from a solar cell – up to the max charge rate! Temperature monitoring of battery by soldering in a 10K NTC thermistor (not included) – suggested for outdoor projects where the battery may get hot (50°C) or cold (0°C).